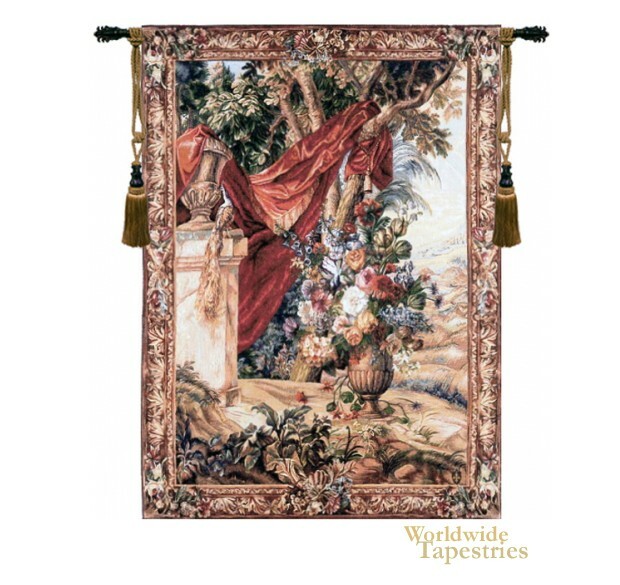 Bouquet Au Drape II tapestry shows a French landscape scene of flowers, urn and countryside with a red drape. This classic French scene in this Draped Bouquet tapestry is a floral still life as well as a verdure, and shows the beauty of flowers in a natural landscape which accentuates its beauty even more. Here a rich floral bouquet is the central focus, and nearby is a tree with a red drape n its branches. The foliage of the plants in the foreground shows glorious detail and a stylized approach, which is the hallmark of the traditional verdures that came out of France and Belgium. An extravagant border completes the work. Full of beauty, this floral landscape tapestry "Bouquet Au Drape II" is backed with a lining and has a tunnel for easy hanging. Note: tapestry rod and tassels, where pictured, are not included in the price.